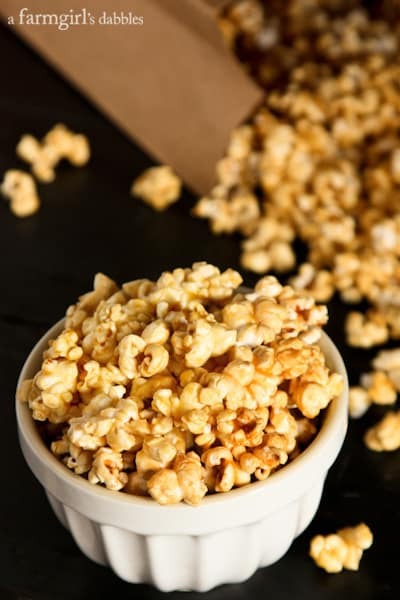 All you need are about 15 minutes, plus a few simple ingredients, a microwave, and a brown paper bag for my Mom’s Microwave Caramel Popcorn! It’s this time of year, during the holidays, that my craving for caramel popcorn is fiercest. As if there weren’t enough sweets to be had with all the pretty cookie platters and holiday gatherings. But my craving is what it is, and I don’t even try to fight it anymore. 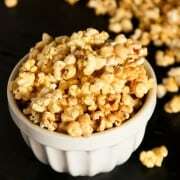 My favorite caramel corn is a recipe from my friend Ann, an oven-baked version that is absolutely phenomenal. 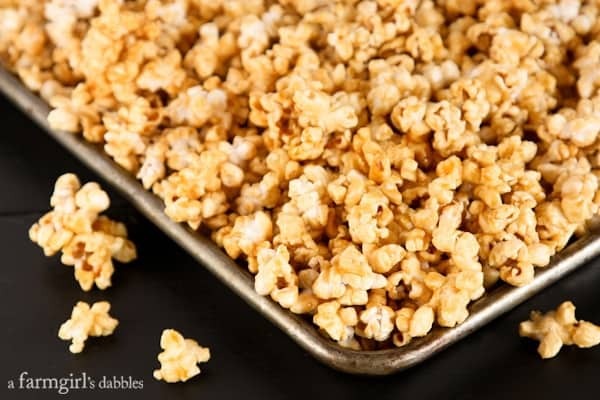 But it does require a candy thermometer on the stovetop and some babysitting in the oven, which amounts to stirring the caramel corn every 15 minutes a few different times. And that is where the beauty of my Mom’s Microwave Caramel Popcorn recipe shines. It’s easy peasy. No candy thermometer or oven baking required! I remember enjoying this sweet treat when we were young, but haven’t had it in so many years. Then, when we were back in South Dakota for corn harvest in October, Mom made a batch of this microwave caramel popcorn one evening. In a very short amount of time, she had a fresh crunchy batch of delicious caramel popcorn set out on the counter. I couldn’t believe how quickly it came together, and then how very delicious it was! 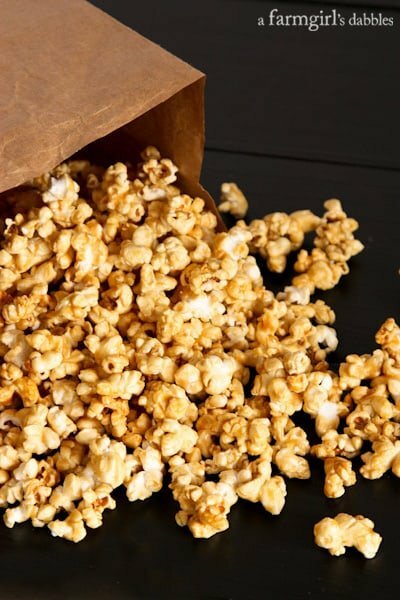 All you need is popped corn and a few simple ingredients for the caramel, a microwave, and a brown paper bag. 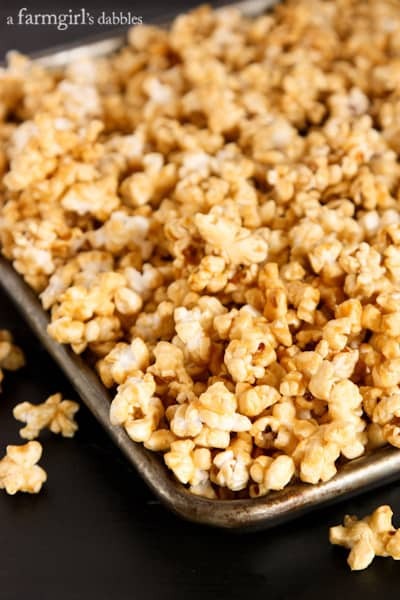 Give yourself about 15 minutes and you’ll have a pan of caramel popcorn cooling in a pan on the counter, ready to indulge in. I’m not gonna lie…that oven-baked version from my friend Ann is still #1 in my book. It has a little deeper flavor, a little fuller crunch. But this microwave recipe from Mom is what I’ll be making more often from here on out. It’s just too easy to put together, and is still incredibly delicious. Now I have every reason to enjoy wonderful homemade caramel popcorn whenever the craving hits me, any time of year. Place popped corn in a grocery-size brown paper bag. Set aside. In a medium microwave-safe bowl (a bowl with a spout works great), combine brown sugar, butter, corn syrup, and salt. Microwave on high for 2 minutes. It will be boiling. Stir in vanilla, and then the baking soda, until combined. Immediately drizzle caramel mixture over popcorn in the paper bag. Fold top of paper bag over a couple times and shake well to evenly coat the popcorn. Set bag in microwave and cook for 1-1/2 minutes. Remove bag, shake again, and then microwave for another 1-1/2 minutes. Pour caramel corn out onto a rimmed cookie sheet. Spread out caramel corn, breaking up clumps if desired. Immediately sprinkle with a bit more kosher salt, if desired. Let cool completely. Note: Microwave power can vary quite a bit from microwave to microwave. Adjust cook time accordingly. change the recipe to 1/2 cup brown sugar, and 1/4 tsp of baking soda and the caramel is much thicker. My caramel corn is chewy. Do you know why it won’t harden and be crunchy like caramel corn is supposed to be? Thank you Brenda for your website. I grew up on a farm near Gettysburg, SD. So many of your recipes really hit home. 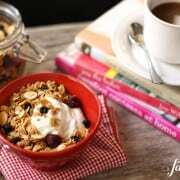 Lots of good basic recipes I’ve enjoyed eating and making. Lovely to meet you, Andrea. Thanks for saying hi! Awesome! we made it and it was sooo easy and delicious! Thank you! Yay! Thanks for coming back to let me know. Enjoy! Okay! Got a question…..So the corn is already popped before adding the carmel mix to the bag correct?? This sounds really good. Thank~You! I made a half batch and divided it between two lunch-size paper sacks sprayed with Pam. No sticking! I used an 1100 watt microwave and only heated the coated popcorn for two intervals of 45 seconds. Great recipe! Pingback: This Week for Dinner – Weekly Meal Plans, Dinner Ideas, Recipes and More! : Salted Caramel Corn Perfection - This Week for Dinner - Weekly Meal Plans, Dinner Ideas, Recipes and More! Caramel corn always seems so complicated. This is a genius and easy way to make it! I made it tonight – PERFECTION! I would love to have a giant bowl of this popcorn right now! Perfect for the upcoming playoffs. Such a quick and easy snack! I love caramel popcorn. Looks amazing and easy! I am really hoping that Santa checked my wish list this year and saw that a microwave was close to the top of the list! When we sold our house last year, we had a microwave over our stove and we had to leave it behind. I can’t believe I’ve gone this long without one. I really miss it. 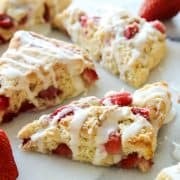 I would love to make this as the recipe is so simple. Hopefully I’ve been good this year! Merry Christmas Brenda!! You had me at “no candy thermometer required”!! 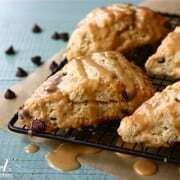 This looks so good and I love that this recipe was handed down from your mama!